SOUTHAMPTON, MA — Like most youth of her generation, Rylie Simmons, 8, is adept at using today’s technology to watch gymnastics on YouTube or to research do-it-yourself projects like how to make such as how to make slim foam. But, like many youngsters — and adults — Rylie, her sister Katherine, 10, and the students at William E. Norris School in Southampton couldn’t begin to explain how the applications that power the computers, tablets, video game consoles and smartphones actually work. So on a recent school night earlier this month, the sisters ventured to their school with their mom, Laurie, for a workshop on how to create computer code. “I wanted them to learn more about computers,” said Laurie Simmons, figuring the introduction would be beneficial. 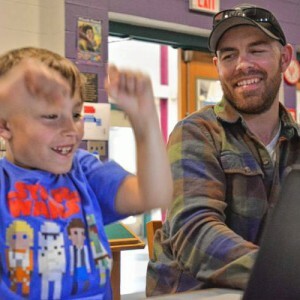 About a dozen families attended the May 2 family code night hosted by Hampshire Regional School District, where they learned the basics of coding — or instructing a computer program — and completed coding puzzles from Code.org. “Understanding the technology that is underneath our screens and in our phones… having some sense of that is really important,” said Kevin Hodgson, a sixth-grade teacher at Norris. Hodgson said the code night is a way to energize and attract young students to think about computer science — not only as a career, but to gain a knowledge in how things work.